If you have a WordPress site, I got you covered. With a monthly, quarterly or yearly retainer, I'll make sure that your shiny WP website continues to perform well for you and your visitors. WordPress is a powerful beast, but with great power comes a lot of complexity, so it can be hard to keep a WP site under control. Plugins & themes need to be often updated, and they sometimes don't play well with each other. But I can handle that work and see to it that your WP website is running smoothly. In the long run, you'll be saving money by protecting your website and having me do ongoing testing, maintenance & iterative improvements. The 3 WordPress care plan options are all about prevention and always having a helping hand for support and fixing any problems. 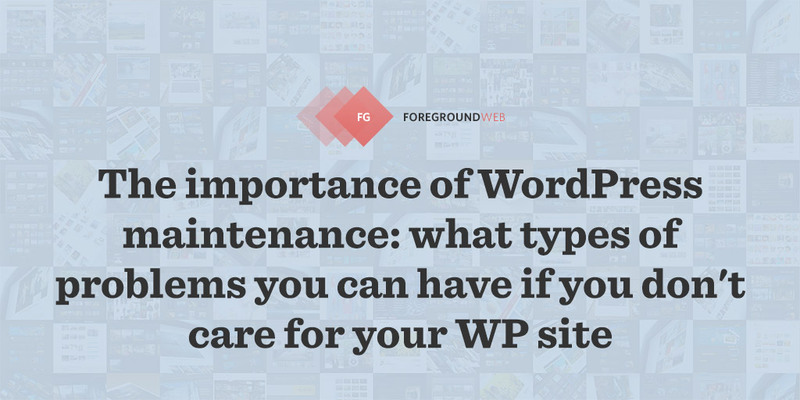 Leave the responsibility of WP maintenance work in the hands of a WordPress expert. I want to become your dedicated webmaster and to help you maintain a healthy & secure photography website. Monthly plans have a 3-month minimum commitment, to know that you're serious about your site. Advanced web-design work - If you need help with tweaking the look or functionality of your site (beyond the included 1h monthly), or fixing damages caused by third-party modifications to the site, we'll discuss that as a separate mini-project. Liability - Since I cannot always control the quality of the themes/plugins or hosting service you use, I will not be liable to you or any third party for damages. What I can offer instead is a strong commitment to protect the site and your best interests. Content management assistance - Prefer not to see the WP admin area at all, but still want to add new posts? I can surely help you (adding your content to the site, taking care of page layouts, styling, formatting, etc. But it goes outside the scope of the WordPress care plan, so we'll treat it separately. Email marketing assistance - On a separate basis I can also help you manage your mailing list service: lists, segmentation, merge tags, automation workflows, etc. 1. Your photo website is an essential part of your business. It's your image portfolio in the digital age and the engine that generates more sales/clients for you. Playing such a key role in the success of your business, make sure it's fully functional for your audience 24/7. Otherwise, if it's slow or partially broken, you lose clients & money. And if it's poorly secured, it can get hacked & blacklisted, a nightmare to recover from. Being so popular (with tens of thousands of themes & plugins out there), the WordPress core and plugins are often the targets of various hacks and exploits. It's simply the nature of the online world, and all can you do is have plenty of preventive measures in place, and a helping hand nearby. What happens to a poorly managed WP site? Combining WordPress with poor hosting services, improper management, security attacks and negligence, and you get a slew of possible errors. If you build a new website on WordPress and then you never touch it again, you never log into the admin area, it’s just a matter of time before it will go down or get hacked. Unless you’re actively updating things, checking logs and being well informed of recent vulnerability threads, you’re not really on top of things. The solution is prevention: properly manage your WordPress site to avoid security and functionality problems down the line. Why not manage it yourself? All the WordPress maintenance tasks I cover on a monthly basis require a lot of time (not to mention WP experience), taking you away from photography work. Keeping up with all the web-design trends and with the always-evolving WP plugin ecosystem is likely not one of your top priorities. And don't fall for all the hosting providers that advertise "managed WordPress sites", that's just shallow stuff, they're automating a few admin tasks for thousands of customers at once. You need a dedicated person that can pay close attention to all the particularities of your website. Start caring for your WordPress site! After payment, I'll get in touch with you shortly afterward to confirm it and schedule the start of the WP care plan work. If you can't afford hiring me to handle your WP site's well-being, at least learn all the basics yourself and turn your site into a well-oiled machine. Anything else you want to ask? Send me a quick email, I reply to every single one. Interested in other ways to improve your WordPress site? Check out my other services or start reading some of my articles.